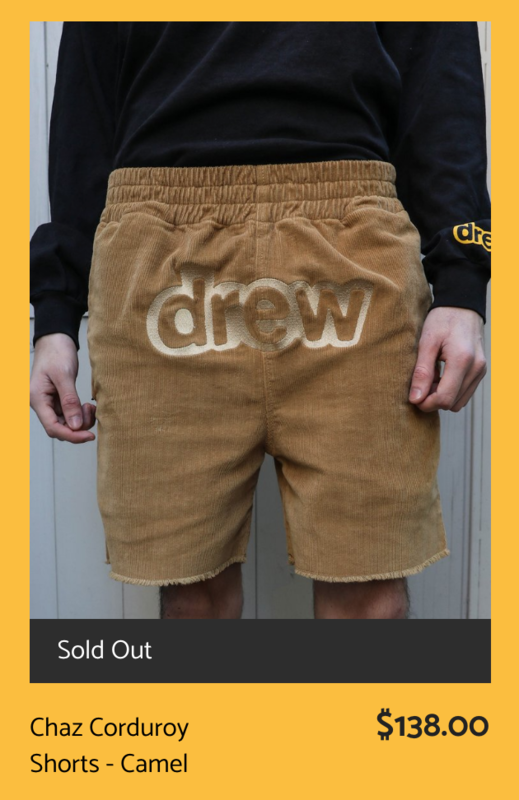 I would like to have a word with the people who allowed Justin Bieber’s new clothing line, Drew House, to sell out in 24 hours. No, really. Are you on drugs? Are you on the same drugs that Justin Bieber is on? Is that why you paid a sweaty-looking pop star worth $265 million an additional $138 to own a pair of tan corduroy shorts with a stretch waistband that have – wait for it – his middle name superimposed in bubble letters over your junk? These shorts just handed me a tab of questionable acid. Ugh. Merchandise. Most influencers have it. Most of it looks incredibly underwhelming and cheap while simultaneously being really overwhelmingly expensive. Because white mediocrity can be screen printed on a unflattering t-shirt for $50, and worse than that, because fans of white mediocrity (see: Twitter) will buy it. Even these models, who were probably compensated in Fiji Water, don’t look good in the shirts they’re modeling. So how does the pinnacle of bad influencer merchandise masquerading as trendy streetwear get made? Well, in this case, it starts with Bieber, who is still unkempt and suspiciously married. Remember when he ate that burrito sideways this summer, but it turned out to actually be some YouTubers trying and succeeding to go viral by impersonating him? The internet is a weird place these days. Yeah, that was the most exciting thing to happen to Bieber in months, and it wasn’t even really him. In lieu of putting out a new album I like to listen to while pre-gaming, Justin decided this was the year to make the fashion equivalent of a stale bong hit. We get it! You had to wear corduroy pants for your fourth grade choir concert and it stunted your emotional development! That’s not our fault! There are 14 pieces that range from your classic “I put as little effort into a logo as I possibly could and screen printed it onto a sweatshirt and now I want you pay me a Benjamin for it” fare to some corduroy items that you’d be better off buying at a K-Mart. Now, people (read: tweenagers who use their parents’ VISA cards to give Twitch streamers rent money) were initially a little irked at how much the Biebs was charging for his line. They were also apparently comparing it to Yeezy, which – and I hoped I wouldn’t have to say this in 2019 – is a little rude to Kanye, don’t you think? “you can’t hum while holding your nose closed.” Look, mom! Some twenty-something who works for a marketing agency and makes enough money to live in L.A. came up with a quirky gimmick for the kids! But as per the items’ descriptions, these ill-fitting long sleeves and vomit-inducing greige pullovers are ETHICALLY MADE! Which, okay? The money is still going toward the relentless wheel of digital capitalism, so I’m not actually impressed? As YouTube fashion commentator HauteLeMode pointed out, this also doesn’t mean that the fabric was ethically sourced, that the dyes are non-toxic, that rivers near factories producing the fabric aren’t being polluted, and so on and so forth. Besides the hideous, almost greasy-looking clothing itself, there’s the eyeroll-inducing Instagram account @drewhouse that really boils my blood. We, as consumers, are BETTER than fodder for West Coast elites trying to sell us bad clothes by making a video of some girl holding french fries! We must DEMAND something other than a ripoff of the ‘Face Without Mouth’ emoji (😶)! Please, sir, I thought VSCO’s glitch filters went out of vogue years ago! But, since the line flew off the metaphorical shelves, I guess we’re not. I guess we deserve this hellscape after all.